For the note on the early Christian FISH SYMBOL and their later use of the CROSS as an identifying mark, scroll to the bottom of this page. The Deccan Chronicle is South India’s largest circulation pro-Christian newspaper and the newest proponent in Chennai of the St. Thomas in India fable (following The Hindu and The New Indian Express). It is a popular newspaper that depends entirely on Hindu subscriptions for its existence, and therefore must hide its anti-Brahmin, pro-Catholic agenda. This is done by promoting anti-Hindu views covertly from behind a columnist’s byline or by publishing the provocative statements of the local San Thome Cathedral priest. The priest, who cannot distinguish between his beliefs and real Indian history, declares: ”The existence of the San Thome Church is a proof by itself that Christianity in India is more than 2000 years old” (Deccan Chronicle, Chennai, 8 April 2007). The San Thome Cathedral pastor is alluding to the St. Thomas in India legend and the claim that the apostle St. Thomas established Christianity in South India in 54 AD. The story is accepted tradition among Christians in Kerala. It is also a classic Christian persecution and martyrdom myth that was invented to malign and demoralise Christianity’s religious opponents. Christians have vilified Jews for 2000 years by blaming them for the murder of their god, and Christians have vilified Hindus for centuries by claiming that a Brahmin priest or Hindu king in Mylapore murdered St. Thomas. Both ancient communities, Jews and Brahmins — the latter being the custodians of Hindu culture — can thereafter be charged with deicide and subjected to the most wicked abuse and overt attempts to exterminate their religion and culture. The mainstream media in India subscribes to this vicious communal agenda and promotes the fable in its columns at regular intervals though it has been aware of the legend’s falsehood and malefic intent for at least twenty years. This is inexcusable by any universal standard but gives a revealing insight into the nature of secular democracy and freedom of speech in India today. Hindus have no voice in the English-language print media and have become second class citizens in their own motherland. In states like Tamil Nadu they are virtually a disenfranchised people and under constant attack by an atheistic, racist government that overtly supports the foreign-financed Christian missions and NGOs that work in the state to alienate the Tamil people from their ancient civilization. The Deccan Chronicle’s current resident editor in Chennai is cricket commentator R. Mohan, a self-righteous secularist of the Nehruvian school who assiduously follows the Christian practice of treating Hindu history as mythology and Christian mythology as history. In true Indian secularist fashion he does not tolerate dissent and letters sent to the editor concerning the lies and distortions that appear in Deccan Chronicle articles are neither acknowledged or published. Every effort is made by Mohan and his correspondents to provoke and insult Hindu readers and undermine their Hindu identity. This culturally subversive activity is called “freedom of the press” in our secular socialist India that is Bharat. Chairman Reddy and resident house boy Mohan regard criticism of themselves and their “eminent” contributors — many of them foreigners based in London and New York — as a manifestation of Hindu communalism and ignorance. Indeed, dissent can attract a very spiteful response from Mohan Sahib (as this writer knows from experience). Yet both of these clever media men, whose decisions influence the opinions of half a million readers and more every day, will ignore facts and figures as extraneous irritants except where the facts and figures can be employed in subtle Hindu-bashing exercises or otherwise to whitewash the bigoted, violent and licentious history of Islam and Christianity in India. What follows is a collection of short items that are related to the St. Thomas legend, that appeared in the Deccan Chronicle in 2008. The items. called “name-stake” items with photos were published to establish the Christian ownership of the places they describe. The truth that all the places described once had Hindu temples on them until the Portuguese arrived, is thus negated and erased in the public mind. Ishwar Sharan responds: The appellation “Apostle of India” for St. Thomas is a recent Roman Catholic invention conceived in 1953 when Cardinal Eugene Tisserant brought a piece of St. Thomas arm bone from Ortona to Kodungallur for a shrine. Prior to this date St. Francis Xavier held the title Apostle of India. Prof. Leonardo Olschki, a world authority on Christianity, writes,“The Nestorians of India [Syrian Christians] … venerated St. Thomas as the patron of Asiatic Christianity — mark, not of Indian Christianity”. This sly communal tale, invented by Jesuits and improved on by Fr. D’Souza, is peculiar to Madras [and still published by the San Thome Diocesan Press in Chennai]. He tries to establish Hindu support for the story, by quoting Hindu publications that repeat it. But Hindu traditions about Little Mount and other “St. Thomas” sites are quite different and much older than those of the Portuguese. They believe that the hillock, with its cave and spring and imprint of peacock’s feet in the rock, was sacred to Murugan, and Hindu women used to visit the site even after the Portuguese had cleared it of Hindu shrines. In 1551, a church was built by the cave, called Our Lady of Health, and the Jesuits built a second church by the spring. Nothing remains of these buildings today, and the archaeological evidence on the site was destroyed years ago when it was blasted to make way for the modern church that now stands there. This rendition of the fable has no equivalent in Malabar and no relationship to the account in the Acts of Thomas, though it does have in it the priest and the lance found in the Portuguese De Miraculous Thomae. There is no record that Mylapore had a temporal king of any name in 68 CE — the date first appeared on a memorial plaque in San Thome Cathedral in the eighteenth century and was afterwards incorporated into the story. But as is the case with many historical fabrications, it contains an element of truth and this gives the fictional parts credibility. Mahadevan is a reference to Lord Shiva, who was of course the King of Mylapore in the first century CE, even as He is the King of Mylapore today. Ishwar Sharan responds: The article above is a continuation of the Deccan Chronicle’s policy of prostituting Indian history to further its pro-Catholic agenda. Telling lies for Jesus — or in this case for his brother Thomas — has never been a problem of ethics for newspaper chairmen or editors who are born with Hindu names but who willingly sell their Hindu mothers down the river for a few dinars. The Deccan Chronicle and Asian Age are said to be owned by a Saudi Arabian company. There is no contradiction here between an Arab-owned Indian newspaper and its pro-Catholic agenda, as both Muslims and Christians and their secular Indian front men are willing to work together for the total annihilation of Hindu religion and culture. Historically, the first Christian church to appear on the Mylapore beach was built in 1523 by Augustinian friars beside the new tomb of “St. Thomas” that had been dug and seeded with bones and other material brought from Goa by Albuquerque’s attendant Diogo Fernandez. Earlier, in 1521–22, the Portuguese had opened two tombs in the Shiva temple’s northern precincts. One tomb contained a “black” skeleton, which, according to its inscription, belonged to a Chola king. The Portuguese nevertheless “identified” him as being a disciple of St. Thomas (as today Catholic historians “identify” Tiruvalluvar as being a disciple of St. Thomas). The second tomb revealed a “white” skeleton, which, naturally, “belonged” to the white Jew Thomas. This second skeleton was sent to Goa for verification – where it languishes till today, unsung and unrecognised. As these diggings did not produce the required result, Diogo Fernandez was asked, in 1523, to excavate a third tomb which lay partly under the foundation of a dilapidated temple building that had been occupied by the Portuguese. He refused at first but was persuaded by the attending priest, Fr. Antonio Gil, who heard his confession and that of the two men, Braz Fernandez and Diogo Lourenco, who would assist him in the pious enterprise. They then began the excavation of a deep and elaborate, and very much empty, tomb. It was Saturday afternoon, and they continued the work into the late evening, when, on the suggestion of Diogo Fernandez, they abandoned their unproductive labours and retired for the night. The excavation was left open and unattended until the next morning, a Sunday, when the men began digging again. It was not long now before the grave disgorged bones that were “much worn out”, portions of skull and spine, and a clay pot of earth “bedewed with blood”, with a thigh bone in it, and hidden in the red earth an iron Malabar spearhead shaped like an olive leaf, which, after fifteen Christian centuries, still had a piece of wooden shaft miraculously preserved in its socket. This church, originally built in 1523 and called San Thome or San Thome de Meliapore, was subsequently enlarged and extended, and the encroachment on the Kapaleeswara Temple began in earnest. The Christians had done this before, building a church against a temple and then slowing taking over the temple, and that the Shiva temple survived as long as it did, up to 1566 according to some authorities, is grand testimony to the patient and courageous resistance the Hindus of Mylapore had put up against this ruthless Catholic power. In 1606 the Pope, at the request of the King of Portugal, made San Thome de Meliapore into a diocese independent of Goa. The church was extended again and became the seat of a bishop, but, in 1893, this building was demolished by the bishop and the present Gothic cathedral put up in its place. It was completed and consecrated in 1896. 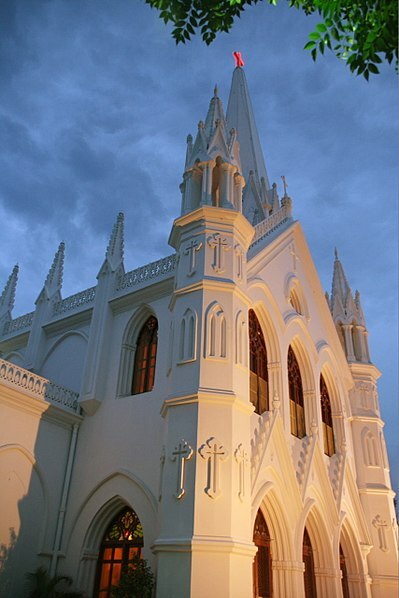 In 1952 the archdiocese of Madras and Mylapore was constituted, and in 1956, after much lobbying by the Indian hierarchy, Pope Pius XII raised the status of San Thome to that of a minor basilica. This church dignity is of no consequence but it affords the archbishop some minor liturgical privileges. Diogo Fernandez’s “St. Thomas” relics still remain in the church today. The iron spearhead and piece of skull are kept in a monstrance, along with the relics of St. Francis Xavier, St. Isabella, St. Vincentio and the Martyrs of Morocco. The first “St. Thomas” tomb, which contained the “white” skeleton that was sent to Goa, is empty and ignored, but the second “St. Thomas” tomb has recently been renovated and refurbished at great expense and a new life-size plaster idol of a “sleeping” Thomas still clutching the spear that killed him lies on top of it and is pointed out to pilgrims and tourists. It contains the remainder of Diogo Fernandezs “findings”, the pieces of spine and thigh bone, and, presumably, the pot of “blood-bedewed” earth. Yet this is not the end of the bones at San Thome. The cathedral also has in its possession a piece of Church-certified Ortona bone, which it obtained from Cardinal Tisserant in 1953, after he had deposited the apostle’s right arm at Kodungallur. The pastor of San Thome can now say with some pride that he is the keeper of a real St. Thomas bone — keeping in mind that the acceptance of the Ortona gift is also an admission that the Portuguese relics in his care are not those of St. Thomas. Chennai and its suburbs are replete with heritage sites such as the Tiruneermalai Vishnu temple (6th century), Tiruvottriyur Adipureeswarar temple (8th century), Kovalam Thameemun Ansari Dargha (7th century) and the St. Thomas Mount near the Chennai airport. It is believed that St. Thomas, one of the 12 apostles of Jesus Christ, died on the mount in AD 72 (first century), which makes it one of the oldest heritage sites in Chennai and also one of the oldest Christian sites in the world. Believed to be one of the first Christians to reach India and preach Christianity in a country dominated by Hindus, St. Thomas was assassinated and the site where he was martyred came to be known as St. Thomas Mount. People of various religions visit the holy shrine, negotiating the 160 steps built by Armenian merchant Choja Bedros Woskan leading to the top with 14 “stations of the cross” erected along the way. At the summit stands the church built by the Portuguese with its altar located at the very spot where St. Thomas breathed his last. There are relics too, among which is the “Bleeding Cross” chiseled by the Apostle himself. The cross, which is said to “bleed” periodically, is believed to have been in the hands of the Apostle while he lay dying. The oil painting of the Madonna, believed to be one of the seven painted by St. Luke, the evangelist, and brought to India by St. Thomas is placed above the altar. This is considered to be the oldest Christian painting in India. The place is also ideal for picnics [and romantic encounters if the warning notices placed by the resident nuns are to be believed]. The metropolis, spread all around the hillock, seems a distant dream land. Ishwar Sharan responds: The Deccan Chronicle in this article continues its St. Thomas deceits, this time with a by-line to absolve the editor of the crime of knowingly misleading the reading public with communal propaganda. Some bits and pieces of Hindu archaeology are thrown in with the express purpose of making the alleged Christian site — St. Thomas Mount — the older/oldest place of pilgrimage. This is in accord with the current Catholic “inculturational” programme of making the great Tamil Shaivite saint Tiruvalluvar a disciple of St. Thomas. According to the Mylapore archbishop and his spin doctor Deivanayakam, Tamil Shaiva Siddhanta and the Tamil bhakti movement are a by-product of the Christianity that St. Thomas brought to India and taught to Tiruvalluvar — Christianity being the “original” religion of the Tamils. It is all humbug of course, a wicked plan set in motion by wicked priests with the express purpose of undermining the cultural and religious integrity of Hindu society. If the Indian bishops succeed in destroying the Tamil Hindu identity and then appropriating the Tamil ethnic identity for Christianity, they will be well on the way of conquering India for Christ and of gaining recognition in Rome. Recognition by the Pope and Roman Curia is what the Indian bishops crave even more than the power and pelf they already enjoy in India with government support. The late Mylapore archbishop Arulappa admitted as much when his little scam to forge historical documents relating to St. Thomas in India was uncovered. Forging religious artifacts and historical documents is a very old Christian pastime, and it is therefore not surprising to find Indian bishops and their “secular” minions at the Deccan Chroniclecontinuing the “pious” practice in 2008, by attempting to rewrite the religious history of the Tamil people. The late archbishop of Mylapore, Dr. R. Arulappa, in Punitha Thomayar, asserts that Big Mount (St. Thomas Mount) was originally called Brungi (Bhrigu) Malai and was the seat of the Hindu sage Brungi Rishi until St. Thomas came and chased him away. This story, like the one above, is another piece of fiction that has at its core a little truth. The hill was sacred to Brungi Rishi, as the Tamils call Bhrigu Rishi, and it is the Portuguese who chased the “rishi” away, not St. Thomas. The Shiva temple associated with the rishi was destroyed around 1545, when they gained effective control of the hill, which was the highest in the area and the southern limit of their territory. Portuguese historians describe it as being crowded with ruins then, and broken temple stones could still be found on its slopes in 1995, on the south and west side. The Portuguese had begun to settle around Big Mount as early as 1523 — the same year they “discovered” the tomb of “St. Thomas” — and one of the first to take up residence there was Diogo Fernandez. He would succeed in erecting a small chapel on the hill before 1545, but the construction of the church, called Our Lady of Expectation, did not commence until 1547. It was built on the east — west alignment of the temple foundation — the ancient granite base of the flag pole is on the eastern side of the church (and now covered over with asphalt since the publication of our book) — but the Portuguese reversed this order in keeping with established Christian practice when building on a Pagan site, and the church entrance is on the western side. In 1707, the building was extended by an Armenian merchant and the royal arms of Portugal were added to the facade of the main porch. It was when clearing the rubble for the church, in 1547, that the Portuguese “discovered” the famous Persian “St. Thomas” cross in the temple foundation. Diogo Fernandez is not implicated in this fraud, but the Vicar of San Thome, Fr. Gaspar Coelho, and the Captain of the Coromandel, Gabriel de Athaide, are, as the construction was under their direct supervision. What is known for certain is that St. Thomas did not carve this cross — it is dated to the eighth century, like its counterparts in Kerala — and as a cross it did not originate on Big Mount. The inscription around it is in Pahlavi (Persian) and the sculptor has signed his name as Afras the Syrian. It was kept inside the church behind the altar, and used to “bleed” at irregular intervals up to 1704. This phenomenon stopped as soon as the sensible and schismatic British began to move into the area and build a cantonment. The other “St. Thomas” relic in the church is a brightly coloured icon of Mary and the child Jesus. It is said to have been painted by St. Luke and brought to India by St. Thomas, who wore it on his breast as a scapular or badge of mission. In fact, it does not appear in Portuguese records until 1559, and the diverse stories that go with it were invented after this date. The church also has paintings of all the Apostles and of St. Thomas and his Hindu assassin. One of them, on the reredos of the altar, depicts an Iyengar Brahmin with namam, about to stab the praying apostle from behind. It defeats its purpose inasmuch as Vaishnavas did not wear namam, the U-shaped forehead mark, until after Ramanuja introduced it in the eleventh century. The other painting, very large and part of a series of the apostles and their various modes of death, shows St. Thomas with a book, a lance, and his sturdy Hindu assassin, who, this time, does not wear sectarian marks or orthodox dress. The paintings and altar decorations were contributed to the church by the Armenian merchant community in Madras in the eighteenth century. The narrow road wound its way uphill, past houses bearing names like Rose Cottage, many camouflaged by the exuberant greenery in their gardens. The ambiance was straight out of a hill station. We were in the city to explore the story of St. Thomas, one of the 12 disciples of Jesus, who is said to have come to Kerala in 52 AD and then moved to Chennai where he eventually died in 72 AD. 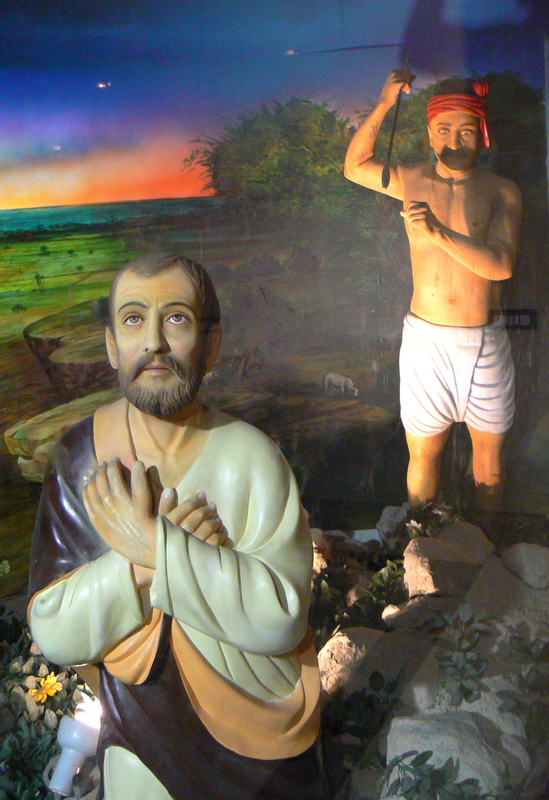 Our exploration of the apostle’s Chennai connection began where he died, at St. Thomas Mount. The peripatetic Italian, Marco Polo, who visited Chennai in the 1290s, recounts the story Church brethren told him of how the saint was killed when a hunter aiming at some peacocks accidentally hit the apostle. At the summit is the Church of the Expectation of the Blessed Virgin, a simple church that is devoid of ostentation, but rich in myth and legend. It was first built by Armenians and rebuilt by the Portuguese in 1521 and again in 1547. The Armenian influence is evident in the 14 beautiful paintings (dating to the 1700s) of Jesus and the apostles that line the walls. You can also see many Armenian inscriptions in and around church. The altar here is believed to mark the spot where St. Thomas fell. The cross embedded in the wall behind the altar has an interesting story. It was unearthed by the Portuguese during excavations here. The large granite slab bears a cross and an inscription on top, and once had red stains on it. This is the famous bleeding cross, which has been reported to sweat blood several times between 1556 and 1704. Tradition has it that it was fashioned by St. Thomas himself and that he died holding it. But controversy and doubts seem essential ingredients of all stories associated with Doubting Thomas. The strange lettering inscribed on the cross definitely added to its aura of mystery. Although it was first assumed to relate to St. Thomas, in the late 1800s historians realised the inscription was actually in Pahlavi and, somewhat anti-climatically, had nothing to do with St. Thomas, but recorded only the name of the person who fashioned the cross. The inscription and hence the cross were dated to 650 AD, making it the oldest of only about half a dozen such Nestorian crossed in India. Next to the bleeding cross is a beautiful oil painting on wood of the Madonna with baby Jesus, which according to legend was brought to India by the apostle himself and was painted by Luke the evangelist. Our next stop was the stately Santhome Cathedral Basilica, near Marina beach, built over the spot where St. Thomas was buried. The church’s fortunes seem to have waxed and waned through the centuries for, although a magnificent church stood here in the 1200s, by the 1500s it was languishing. The Portuguese rebuilt it in the 1600s. In 1893, this building was demolished and the church in its present form came up and was consecrated in 1896. Today’s cathedral is a grand Gothic edifice, complete with soaring towers and spires. Light streams in through exquisite stained glass windows in the clerestory. One set of three large stained glass windows depicting the episode where Jesus appears to Doubting Thomas, was made in Germany in the 1870s. Ishwar Sharan responds: The Deccan Chronicle appears to have become aware that it cannot maintain its St. Thomas deceits forever. It has changed tactic, conceding that the bleeding cross on Big Mount is a Nestorian creation of the seventh century but introducing Marco Polo’s story of having visited the Coromandel Coast and seen the apostle’s tomb for himself in 1292. Marco Polo did not visit the Tamil coast at any time in his career, nor did he name the little town on the Tamil coast that allegedly played host to St. Thomas’s tomb. Marco was a story-teller and one of the world’s great liars. Dante Alighieri, author of the Divine Comedy, said as much even during Marco’s lifetime. Today there are scholars who doubt that Marco Polo ever left Constantinople or visited China. Marco Polo collected his travel tales from Muslim and Syrian Christian merchants who came to Constantinople to trade. His fabulous travel book called Il Milione was dictated to a cell mate when he was in prison in Genoa. We may assume that Marco Polo never went to China. But even if he did, he never visited the Coromandel Coast as he was “in China” in 1288 and in 1292 which are the dates given for his Coromandel visit. But this is not the main thrust of the Deccan Chronicle’s St. Thomas articles that appear regularly at intervals to mislead the Chennai reading public. The Deccan Chronicle is trying to establish in the public mind that there were always Christian churches of one sort or another on the sites now claimed for St. Thomas. They have now introduced the Nestorians — and Armenians who were late comers — whom even Chennai’s pseudo-historian Muthiah does not depend on to authenticate the St. Thomas churches. If the Deccan Chronicle and Madras-Mylapore Archdiocese can establish that there were churches in Mylapore and Saidapet and on Brungi Malai — St. Thomas Mount — before the arrival of the Portuguese in the early 1500s, then the Hindu claim to these sites stands cancelled. But there is no authentic record of churches in Mylapore and its surrounds prior to the arrival of the Portuguese. None at all. And on the three sites in Madras associated with St. Thomas, there is — or was until we published our observations in 1991 — Hindu temple rubble. This writer has seen it himself on St. Thomas Mount and in 1985 was able to identify the granite foundation stone for the flag pole of a Hindu temple that existed on the hill prior to 1545. There is also the testimony of the late Archbishop of Madras-Mylapore, Dr. R. Arulappa, in his book Punitha Thomayar that yantra stones from the foundations of Hindu temples were found in all St. Thomas sites. And there is the eye-witness account of G.P. Srinivasan in his article “Santhome Cathedral Cover-up Uncovered”, of temple rubble being removed from the San Thome Cathedral compound surreptitiously in 2001. And lastly there is the official testimony of Dr. R. Nagaswamy, former Director of the Tamil Nadu Department of Archaeology, that inscriptions on stone found only in Shiva temples were found in the walls of San Thome Cathedral. But none of this evidence exists today in the public sphere (though records will be there in government archives). 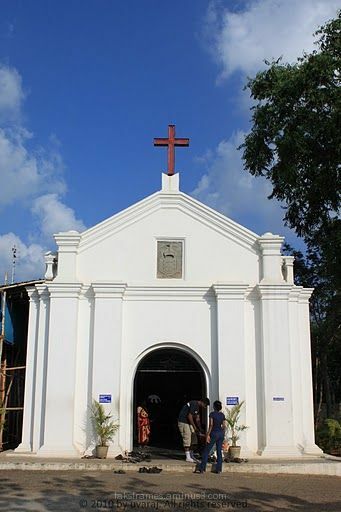 It has all been removed by the San Thome diocesan authorities and the three Madras churches associated with St. Thomas have been cleaned up and renovated at the cost of crores of rupees. They are major tourist attractions, attract money and prestige for their Christian owners, and the Catholic Church has never been known to give up land it has acquired for any reason. That said, this writer has never at any time demanded that the three sites be returned to their legitimate Hindu owners. What he has asked for is a forensic investigation of the so-called relics in the St. Thomas tomb and a full accounting by Church authorities of the crimes committed by the Church and its agents in India over the centuries. The Archbishop of Madras-Mylapore owes the people of Madras an abject apology for the destruction of the Kapaleeswara Temple that once occupied the high point of the Marina beach that is now occupied by San Thome Cathedral. And to establish the sincerity of the abject apology, the Madras-Mylapore Archdiocese may donate a piece of land from the vast Bishop’s House estate to the existing Kapaleeswara Temple Trust for the building of a memorial to the Hindu martyrs who died resisting the Portuguese invaders who destroyed the ancient great Shiva temple. But such an apology will not be forthcoming, for the Indian Church like the Indian media is ruled by brown sahibs who have sold their souls to white sahibs, and who are in fact traitors to their ancient native Hindu civilization and culture. The leaders of India’s Brown Church do not have the moral character to make such a confession — though confession of wrongdoing — unless it is the “doing” of little boys — is very much part of Roman Catholic Christian sacrament. 2] An example of an anti-Hindu exercise is the use of the term “idol” for Hindu images. Technically correct, the word is loaded with negative connotations and is part of the abusive rhetoric of Christian missionaries in India. The same newspaper on another page uses the neutral term “statues” for Christian images. Clearly, there is editorial bias at work here. In the forty plus years that I have lived in India, I have never met a Hindu who worships “idols”. Hindus worship their Gods, and even a simple village woman knows that the Gods are made of spirit not matter. These crosses are evidence of the connection of the Christian church in India with Persia, but they may also be evidence of temple destruction and the planting of Christian relics in temple foundations – at least the one on St. Thomas Mount may be so considered. The motif on this black granite slab is cut in relief, and on each side of the cross, which is surmounted by a descending dove, are pillars crowned with supernatural composite animals, or yalis, from whose mouths issue an arch that joins together above the dove. These yalis are Hindu symbols, not Christian, and Veda Prakash, Director of the Institute for the Study of Western Religions, Madras, asserts that the cross on St. Thomas Mount is an over-cut temple stone. He claims support for this view from the most unexpected quarter. Dr. R. Arulappa, the former Roman Catholic archbishop of Madras, in Punitha Thomaiyar, says that yantra stones in temple foundations were dug up by the Portuguese on three of the four sites in Madras that they associated with St. Thomas and where they built churches—Mylapore, Little Mount at Saidapet, and Big Mount at St. Thomas Mount. The dove-and-cross motif of this stone has been described by one writer as Manichaean and by another as Nestorian. Fr. Herman D’Souza, in In the Steps of St. Thomas, quoting Francis Gouvea on the sixteenth century Portuguese “excavation” at St. Thomas Mount, identifies the motif with that used by the Knights of Aviz in Portugal. The solution to this problem of the origin and identification of the Persian crosses and all other relics associated with St. Thomas is to have them examined by independent forensic experts. If the Bishop of Turin could surrender the famous Shroud of Turin, alleged burial cloth of Jesus, to scientists and accept their verdict that it is a mediaeval fake, then the Archbishop of Madras should be willing to do the same with the various St. Thomas relics in his possession. There are seven of these icons by “St. Luke” scattered around the world. The most famous one hangs in the Basilica of Santa Maria Maggiore in Rome, which was built by Pope Sixtus III in 432 C.E. after he had demolished the Temple of Cybele on the Esquiline Hill. The cross as a symbol of Christianity did not come into popular use until the 3rd century. There are two reasons for this: first, early Christians were practising Jews and the cross was an abhorrent symbol of torture and death, and second, the cross was already used as a religious symbol by adherents of various Pagan cults throughout West Asia and Greece. It is argued by some scholars that the Christians borrowed the cross from the Orphics in the 3-4th centuries. But in fact it did not gain popularity as a Christian symbol till some centuries later. Even if Judas Thomas had come to Mylapore, he would not have made cross symbols as he was a practising Jew. First century Jews whether Moses or Jesus followers (there were no “Christians” in the 1st century) were rigid iconoclasts and could not tolerate Pagan cross symbols. 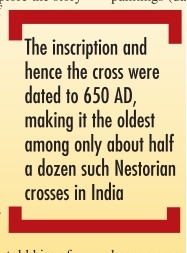 The Christian cross was introduced into India by Christian immigrants from Persia after the 7th century CE. For the first three centuries, Christians used the fish with or without the word “ΙΧΘΥΣ” (Ichthys), Greek for FISH, drawn in the fish body as their identity symbol. The symbol was an acronym for “Ίησοῦς Χριστός, Θεοῦ Υἱός, Σωτήρ”, (Iēsous Christos, Theou Yios, Sōtēr), which translates into English as “Jesus Christ, God’s Son, Savior”. This icon attributed to St. Luke, kept in the Portuguese Church of Our Lady of Expectation on St. Thomas Mount, is very obviously a product of 16th century Portuguese piety. The first icon attributed to St. Luke—there are seven of ‘his’ Theotokos icons in churches around the world—appeared in Palestine in the 5th century and was sent to Constantinople. It is now in the Benedictine Abbey church of Montevergine, Italy. Nor was the Virgin Mary venerated until some centuries later. Historically, neither the cross nor the painting(s) of the Virgin Mary can be associated with the 1st century apostles Thomas and Luke. The association was made by pious Christian authors and artists long after Christianity was imposed on the Roman Empire by Emperor Constantine. The Indian Christian today naively believes that the Christianity of 1st century Jerusalem was a fully developed religious system, the same religion presented to Indians in the 16th century by the Portuguese. This entry was posted in apostle, christianity, hinduism, history writing, indian history, ishwar sharan, kapaleeswara temple, little mount, madras, media, mylapore, religion, saint thomas mount, santhome cathedral, st. thomas, thomas the apostle and tagged bhrigu rishi, brungi rishi, christian controlled media, colonialism, deccan chronicle, indian history, indian media, ishwar sharan, media, mylapore, portuguese, r. mohan, saint thomas, saint thomas mount, san thome cathedral, secular media, t. venkattaram reddy, temple breaking. Bookmark the permalink.